Since 2009, the Oasis Bike Workshop has graduated over 1500 youth from neighborhoods all over Metro Nashville, providing them mentoring to hand-build their own bicycles, from the frame up, through programming at the Oasis Center and in various public schools, libraries, parks and community centers. In 2011, Oasis was able to create a mobile bike workshop that travels to different communities each week. This makes available the program to young people who lack basic transportation by bringing it to their communities and follows the Oasis Center's motto of "reaching people where they are". Thanks to our donors, the Oasis Bike Workshop continues to grow and provide participants with a connection to a caring adult in a safe environment, and empowers them to make positive choices. We encourage participants to engage within their communities and provide them with the training and experience they need to become activists in their own ways. Additionally, the Oasis Bike Workshop promotes the environmental and health benefits inherent to bicycling and provides an answer to the area’s lack of public transportation and access to resources for young people. We view these “mobility deserts” as a social justice issue. It’s late in the afternoon and a group of teenage boys pedals hard down the abandoned runway of Nashville's old Cornelia Fort airport. They’re taking a break from the trails to work on sprints and stamina — and mock each other with shouts of "Dude, you're so slow!" ​“When you get dropped off of the school bus, you’re pretty much confined to your neighborhood,” says Dan Furbish, who runs Oasis Bike Workshop, which provides students with bicycles and mentoring. He finds that many kids have not visited parks just 2 miles from their homes. When school's out for summer, teens can keep rolling at the Oasis Bike Camp. Summer 2017 found us working with non-U.S. born teens from South Nashville. Check out the story on PBS (WCTE-TV)! When it comes to bike shops, there’s nothing quite like the feeling of finding "the one." When Daniel Furbish started a bike workshop at a community center in Nashville, he didn't know that much about building or fixing bikes. He did, however, know what an important tool a bike can be for a kid with little or no other means of transportation. We met him to see how this little experiment turned into a full-time program that has helped hundreds. Dan Furbish talks about the challenges of the youth who don't have access to transportation, how he's teaching a skill, fostering healthy activity, and creating a revolution of change. "It makes me feel good. Makes me feel different than a lot of other kids that have bikes because they just went out and bought one," he says. "Or some people even steal bikes or whatever. And I ... made my own bike from scratch." Lamarkus, a 9th grade Bike Workshop participant. 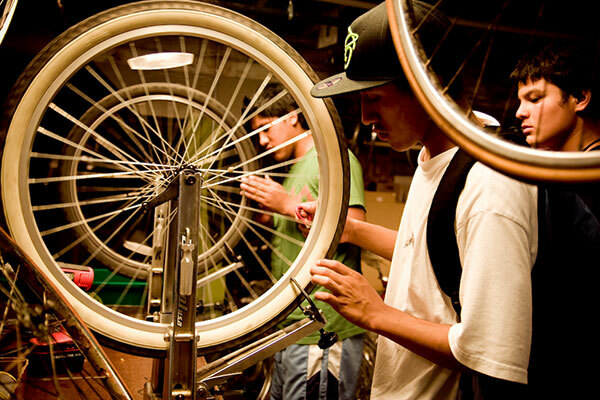 In 2012, the Oasis Bike Workshop partnered with the R.E.A.L. Program in an unique collaborative. Together, Ron Johnson and Dan Furbish set out to help youth entangled in the juvenile justice system find powerful connections between rebuilding their lives, and rebuilding bicycles. The end result was a pivotal, life altering experience for all the workshop participants. The spin of a wheel and the clank of a chain are typical sounds at a bike shop. But to a group of teens, they are the sounds of freedom. Building a new generation of biking enthusiasts that reinforce Nashville's commitment to being a "Walk Bike Friendly" city!